Invasive growth of epithelial cancers is a complex multi-step process which involves dissolution of the basement membrane. Type IV collagen is a major component in most basement membranes. Type VII collagen is related to anchoring fibrils and is found primarily in the basement membrane zone of stratified epithelia. Immunohistochemical studies have previously reported changes in steady-state levels of different α(IV) chains in several epithelial cancer types. In the present study we aimed to quantitatively determine the mRNA levels of type IV collagen (α1/α4/α6) and type VII collagen (α1) during colorectal cancer carcinogenesis. Using quantitative RT-PCR, we have determined the mRNA levels for α1(IV), α4(IV), α6(IV), and α1(VII) in colorectal cancer tissue (n = 33), adenomas (n = 29) and in normal tissue from the same individuals. In addition, corresponding tissue was examined from healthy volunteers (n = 20). mRNA levels were normalized to β-actin. Immunohistochemical analysis of the distributions of type IV and type VII collagens were performed on normal and affected tissues from colorectal cancer patients. The α1(IV) and α1(VII) mRNA levels were statistically significantly higher in colorectal cancer tissue (p < 0.001) as compared to corresponding tissue from healthy controls. This is an early event as tissue from adenomas also displayed a higher level. There were small changes in the levels of α4(IV). The level of α6(IV) was 5-fold lower in colorectal cancer tissue as compared to healthy individuals (p < 0.01). The localisation of type IV and type VII collagen was visualized by immunohistochemical staining. Our results suggest that the down-regulation of α6(IV) mRNA coincides with the acquisition of invasive growth properties, whereas α1(IV) and α1(VII) mRNAs were up-regulated already in dysplastic tissue. There are no differences in collagen expression between tissues from healthy individuals and normal tissues from affected individuals. The basement membrane (BM) acts as a barrier separating the epithelium from the underlying stroma. BMs are composed of a number of collagens and non-collageneous proteins. Type IV collagen is a major component and is present ubiquitously in all BMs [1, 2]. Type IV collagen is composed of six genetically distinct chains (α1(IV) to α6(IV)) assembled in triple helical domains. Three molecular forms of type IV collagen, composed of α1(IV)2/α2(IV), α3(IV)/α4(IV)/α5(IV) and α5(IV)2/α6(IV), have been characterized. The α1(IV) and α2(IV) chains are widely distributed and found in all BMs of the whole body whereas the α3(IV) – α6(IV) chains are distributed in the BMs in a tissue-specific manner [3–6]. All six type IV collagen α-chains have been identified in the human colon by immunofluorescence staining using chain-specific monoclonal antibodies . Invasive growth is a hallmark of malignancy in cancers and several studies suggest that the loss of tissue specific α(IV) chains in the epithelial BM may be related to biologically significant events in the invasive stage of cancer in different tissues [8–17]. Type VII collagen is related to BM anchoring fibrils and is composed of three identical α chains in a triple helical domain . It is in addition to type IV collagen an important component of collagen under stratified squamous epithelium. A few studies have demonstrated the presence of type VII collagen in normal colon as a linear staining of the subepithelial BM [19, 20] or in dysplastic epithelium . It has been suggested that type VII collagen is involved in the process of early invasion . 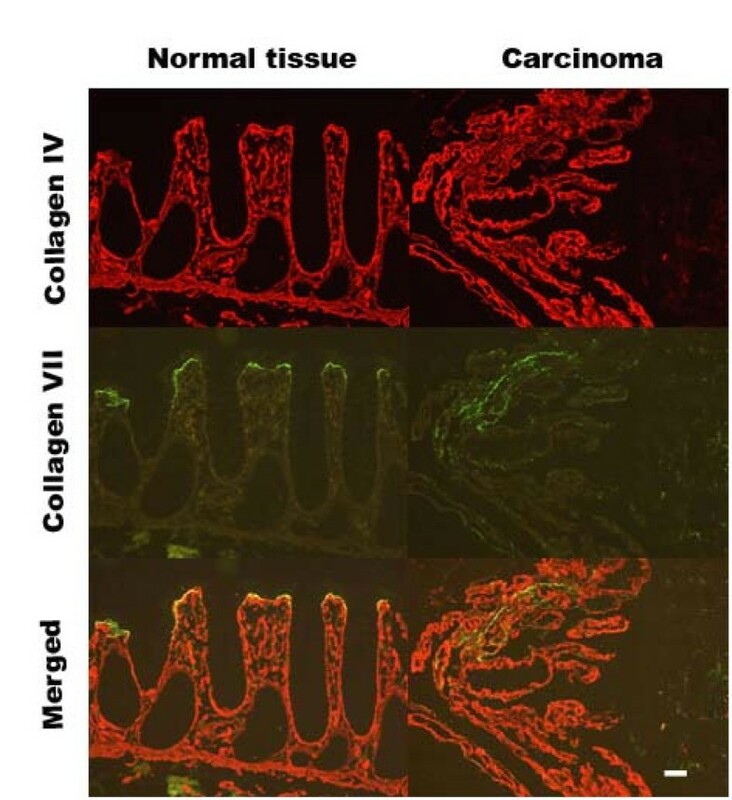 In the previous studies, the distributions of type IV and type VII collagen in normal and colorectal cancer tissue have mainly been studied by use of immunohistochemical methods – a technique that allows a semi-quantitative measure of the protein steady state level. In the present study we have for the first time investigated the mRNA levels of type IV collagen (α1(IV), α4(IV), α6(IV)), and type VII collagen in affected and normal tissue from individuals with colorectal adenomas and carcinomas as well as in normal tissue from healthy individuals. Our aim was to investigate which changes in the mRNA levels of the BM collagens coincide with the acquisition of invasive growth properties. The KAM study is approved by the Regional Committee for Medical Research Ethics and the Norwegian Data Inspectorate, and informed consent has been obtained. The ID number for the NORCCAP study at Clinicaltrials.gov is NCT00119912 . Total RNA was purified from tissue as recommended by the manufacturers using E.Z.N.A. Total RNA Kit II (VWR, Copenhagen, Denmark). The tissue had been stored in liquid N2 before RNA purification. RNA purification included a DNAse treatment. The cDNA synthesis was performed on approximately 200 ng RNA per 20 μl using High-Capacity cDNA Archive Kit (Applied Biosystems). Quantitative RT-PCR was performed using SYBR® Green. All assays were performed using the ABI 7300 Sequence Detection System (Applied Biosystems). Primers were obtained from TAG Copenhagen.α1(IV) F, 5'-CAG CCA GAC CAT TCA GAT CC-3';α1(IV) R, 5'-GGC GTA GGC TTC TTG AAC AT-3' . α4(IV) F, 5'-AGA GAT TGC TCT GTT TGC CAC-3'; α4(IV) R, 5'-CGG TCC CCT CTC ATT CCT T-3' (Primerbank). α6(IV) F, 5'-CTC CTT GCC CTC ACT CAT AGC-3'; α6(IV) R, 5'-GTC TCC CTT AGG CCC TTT AGG-3' (Primerbank) α1(VII) F, 5'-CGG AAC TGA CCA TCC AGA AT-3'; – 3' α1(VII) R, 5'-AAT AGG GTG CTC ACG GTC AC-3' . β-actin F, 5'-CTG GCA CCC AGC ACA ATG-3'; β-actin R, 5'-AGC GAG GCC AGG ATG GA-3' (Primer Express 3.0). The PCR reactions were performed using 900/50/900/300/900 nM F primer and 900/300/300/300/900 nM R primers for α1(IV), α4(IV), α6(IV), α1(VII) and β-actin respectively. Quantitative Power SYBR® Green PCR master mix (Applied Biosystems) was used accordingly to the instructions from the manufacturer. To ensure that the PCR efficiency was equal for both the target gene and the reference gene, we made an efficiency plot with a serial dilution of cDNA. The validation showed that the assays are quantitative over a range of 256/128/16/64/256-fold dilution for α1(IV), α4(IV), α6(IV), α1(VII) provided that a threshold of 0.2 is used for all primer sets. The threshold is a fixed fluorescence signal level above the baseline, and the Ct value of a sample is determined as the fractional cycle number where the sample's fluorescence signal exceeds the threshold. The collagens and β-actin were quantified in separate wells in duplicates. The standard deviation on repeated measurements of the same sample (the control) in separate experiments was 4%, 19%, 30% and 12% for α1(IV), α4(IV), α6(IV) and α1(VII) respectively, indicating the day-to-day variability of the assay. Negative controls (where the RNA is not converted into cDNA) and positive controls were included in all sets. MiniTab Statistical Software, Release 13.1 Xtra (Minitab Inc.), and GraphPad Prism 4 were used for the statistical calculations. The data were not adjusted for gender since the incidence ratio of colorectal cancer between the genders is 1:1 in Norway . The frozen, unfixed tissue sections were mounted on a precooled cryostat table by use of Tissue-Tek (Sakura Finetek). 7 μm thick sections were cut on a Leitz cryostat at -20°C and collected on glass slides. The sections were examined by immunofluorescence microscopy for the localization of type IV and type VII collagens using polyclonal rabbit anti type IV collagen (Abcam 6586) and monoclonal mouse anti-type VII collagen (Abcam 6312), respectively. All primary antibodies were diluted 1:100. Alexa Fluor goat anti-mouse IgG conjugate or Alexa Fluor goat anti-rabbit IgG conjugate (1:400 or 1:800) were used as secondary antibodies. Controls without primary antibody were run in parallel. The sections were finally mounted in antifade mounting medium, with or without DAPI (Vector Laboratories Inc.), and examined in a Leica DM 4000B microscope equipped with a Leica DC 300 FX camera. The distribution of type IV and type VII collagen is shown in Fig 1. In normal tissue from controls and colorectal cancer patients type IV collagen was widely distributed in the extracellular matrix along the BM below the epithelial cells, in the perivascular stroma, and in the muscularis mucosa. In colorectal cancer tissue type IV collagen was detected in the same structures surrounding the distorted epithelial layer. In normal tissue type VII collagen could be detected at the BM of the surface epithelial cells, but could not be detected along the crypts or in other parts of the extracellular matrix. In the colorectal cancer tissue type VII collagen could be detected as a band below the epithelial cells in the distorted epithelium. None of the controls showed any staining. Location of type IV collagen and type VII collagen in normal and colorectal cancer tissue from the same patient. Frozen tissue sections were incubated on the glass slide with polyclonal rabbit anti-type IV collagen and monoclonal mouse anti-type VII collagen. Negative controls without primary antibody were run in parallel (not shown). The bar represents 50 μm. The mRNA levels for α1(IV), α4(IV), α6(IV), and α1(VII) collagens were measured in colon tissue samples from healthy control individuals (n = 20) and in healthy and affected tissue from individuals with adenomas (n = 29) and with colorectal cancer (n = 33) by real-time RT-PCR. Two histologically normal samples were analyzed from individuals with colorectal cancer, one "normal distant" taken as far away from the cancer tissue as allowed by the surgically removed tissue, and one "normal adjacent" taken immediately adjacent to the colorectal cancer tissue. We chose to normalize the mRNA levels of the collagens to the mRNA level of β-actin. The adenomas were characterized as mild dysplasia (n = 1), moderate dysplasia (n = 22) or non-determined (n = 6). The characteristics of the cases and healthy persons used in this study are shown in Table 1. 1The patients with carcinoma are significantly older than the two other groups at 95% confidence level (Kruskal-Wallis test). mRNA levels for α1(IV), α4(IV), α6(IV) and α1(VII) collagens normalized to β-actin are shown in Fig. 2. The α1(IV) mRNA level was increased both in adenomas and colorectal cancer tissue. The α1(IV) mRNA level of colorectal cancer tissue was 6-fold higher than the corresponding tissue from healthy individuals (p < 0.001) (Table 2 and Fig. 2). When comparing affected tissue with normal tissue from the same individual, we found a statistically significant difference between individuals with adenomas (p < 0.001) and individuals with colorectal cancer when compared to both the normal distant and normal adjacent tissues (p < 0.001). The mRNA levels of mRNA for α1(IV), α4(IV), α6(IV) and α1(VII) collagens determined by real-time RT-PCR from healthy individuals (Normal), normal tissue from individuals with adenoma (Adenoma control), tissue from adenomas (Adenomas), normal tissue from colorectal cancer patients taken as far away from the carcinoma as possible from the surgically removed tissue (Normal distant), normal tissue from colorectal cancer patients taken near to the carcinoma (Normal adjacent) or colorectal cancer tissue (CRC). Each dot represents one individual. All mRNA levels were normalized to the level of β-actin mRNA. α1(IV), α4(IV), α6(IV) and α1(VII) mRNA levels in normal and neoplastic colonic tissues. The mRNA levels were normalized to β-actin mRNA levels. *Normal tissue: histologically normal colonic biopsies taken from healthy individuals or individuals with adenomas or carcinoma: ** = normal tissue taken from surgical specimens as distant from the carcinoma as possible; *** = normal tissue taken in close proximity to the carcinoma. a) p value for the comparison of the mRNA levels in normal tissue from healthy individuals with either normal or neoplastic tissue from patients using a one-way ANOVA and Tukey's Multiple Comparison Test. b) p value for the comparison of the mRNA levels in normal and neoplastic tissue from the same patient using paired T-test. mRNA level for α4(IV) displayed little change during carcinogenesis (Fig. 2). We found no statistically significant differences when comparing the level of α4(IV) mRNA in the various groups with corresponding tissue from healthy individuals. The mRNA level for α4(IV) was slightly but statistically significantly lower in adenomas when normal and affected tissue from the same individual was compared (p < 0.001). A similar decrease was observed when normal adjacent and colorectal cancer tissue were compared (p < 0.01). However, no statistically significant difference was seen when comparing the normal distant samples with colorectal cancer tissue. mRNA level for α6(IV) was decreased in colorectal cancer tissue (Fig. 2.). Compared with the level of α6(IV) mRNA in tissue from healthy individuals there was a statistically significant 5-fold decrease in colorectal cancer tissue (p < 0.05). When comparing normal and affected tissue from the same individual statistically significant differences were seen in colorectal cancer patients both when compared to normal distant and normal adjacent tissue (p < 0.001). However, no differences in mRNA levels were detected when comparing normal and affected tissue from individuals with adenomas. mRNA level for Type VII collagen was increased in both adenomas and colorectal cancer tissue (Fig. 2.). The level of mRNA for α1(VII) collagen was increased 3.5-fold in colorectal cancer tissue compared to normal tissue in healthy individuals (p < 0.01). mRNA for α1(VII) collagen was statistically significantly increased in individuals with adenomas (p < 0.01) and carcinomas (p < 0.001) when comparing affected and normal tissue from the same individual. The colorectal cancer patients were staged as Dukes grade A (n = 6), grade B (n = 25) and grade C (n = 16). No Dukes grade D patients were found in this set of samples. No tendency and no statistically significant differences (one-way ANOVA and Tukey's post test for paired comparison) were seen when comparing the α1(IV), α4(IV), α6(IV), and α1(VII) mRNA levels in the different Dukes groups. In the present study we have determined the mRNA levels of type IV collagen (chains α1(IV), α4(IV), α6(IV)) and type VII collagen (chain α1(VII)) during colorectal cancer carcinogenesis. Former studies on colorectal normal and neoplastic tissues have been performed on a relatively small number of patients often not including controls from healthy individuals. Furthermore, former studies have primarily used immunohistochemistry, a technique that can demonstrate the presence of the proteins but only in a semi-quantitative manner. In the present study we have included control samples from healthy individuals in addition to normal tissue from individuals with adenomas and carcinomas. In addition, we have used quantitative real time RT-PCR to indicate the levels of mRNAs coding for collagen chains. To the best of our knowledge this is the first quantitative assessment of changes in collagen mRNA levels during carcinogenesis. Our results show, that the normal and neoplastic colon mucosa express α1/α4/α6(IV) collagens. This confirms earlier results obtained by immunohistochemistry staining using chain-specific monoclonal antibodies . When examining the level of mRNA for α1(IV) we found an elevated level already in adenomas that is maintained in the colorectal cancer tissue compared to both corresponding tissue from healthy individuals and histologically normal tissue from the colorectal cancer patients. The change in α1(IV) mRNA levels detected in this study therefore do not coincide with acquisition of invasive growth properties. Since α1(IV) is widely distributed in the tissue, and not only in the subepithelial BM, its shown up-regulation in the neoplastic tissue might be connected to an increased amount of α1(IV) in stromal BMs as well. Immunohistological studies have previously suggested that α1(IV) is down-regulated in colorectal cancer in relation to tumour differentation . However, when comparing tumours with different Dukes stages we did not show significant differences. We found a diminished mRNA level for α4(IV) in adenomas and cancer tissue as compared to normal control tissue in the same patient. This result is in agreement with a previous study where α4(IV) was undetectable by immunohistochemistry in colon tumour biopsies, but was detectable in normal tissue from the same individual . It has also been described that α4(IV) is partly lost in bronchioalveolar carcinoma of the lung but present in histologically normal adjacent tissue . α4(IV) collagen is localized exclusively in the BM below the colonic epithelial surface and might thus be of interest regarding invasiveness of malignant neoplasms. However, we found that the change of α4(IV) mRNA level is rather small and do not coincide with acquisition of invasive growth properties. By quantitative RT-PCR we found that the mRNA level for α6(IV) was significantly down-regulated in colorectal cancer tissue compared to both healthy individuals and normal control tissue in the patients with carcinoma. There was no significant reduction in adenoma tissue. The loss of α6(IV) is in agreement with suggestions from earlier immunohistochemical studies in colorectal carcinoma [7, 11]. In addition, loss of or the diminished presence of α5–6(IV) collagens have been demonstrated by immunohistochemistry in prostatic carcinoma , in basal cell carcinoma , in lung adenocarcinoma , and in gastric intramucosal carcinoma . In contrast to α1(IV) which is widely distributed, α6(IV) is localized exclusively to the subepithelial BM along the luminal surface and the crypts in the colon  and is therefore of special interest regarding the question of invasive growth. In this study we find that the down-regulation of the level of mRNA for α6(IV) is a late event in carcinogenesis that coincides with acquisition of invasive growth properties. We therefore suggest that down-regulation of α6(IV) might be an important factor for acquisition of invasive growth properties of the tumour. Our immunohistochemical studies show that type VII collagen is present in normal and neoplastic colonic tissue. Our quantitative real-time RT-PCR results show for the first time that there is a significant up-regulation of the level of mRNA for α1(VII) collagen in colorectal cancer tissue compared to both corresponding tissue from healthy individuals and normal tissue from patients with carcinoma. We found that individuals with adenomas have a significant increase in the level of α1(VII) mRNA in the adenoma tissue compared to normal tissue from the same individual. There are no significant differences between tissue from healthy individuals and normal tissue taken from individuals with adenomas or carcinomas. The up-regulation of α1(VII) mRNA is thus already seen in individuals with adenomas and maintained in carcinomas. The pattern of mRNA levels is very similar to the pattern seen for α1(IV). However, as seen by histochemistry type VII collagen is localized solely beneath the surface epithelial cells and therefore – in contrast to α1(IV) specifically reflects alterations along the epithelial BM. Interestingly, the same localization is described for α3/α4(IV) by the use of chain specific antibodies . It might be speculated whether up-regulation of α1(VII) in concert with down-regulation of α4(IV) results in alterations of importance for invasiveness. Type VII collagen is also known as the epidermolysis bullosa acquisita antigen since patients with this disease have IgG auto-antibodies against type VII collagen. A few other studies have shown the presence of type VII collagen in normal colon [19, 20]. Visser et al., (1993) demonstrated type VII collagen immunoreactivity in the BM zone in adenomas and adenocarcinomas but not in normal colon epithelium from 4 control patients and suggested that type VII collagen is involved in the process of early invasion . We find that the up-regulation of α1(VII) mRNA occurs as an early event prior to the acquisition of invasive growth. We therefore suggest that up-regulation of α1(VII) mRNA might be a necessary but not sufficient event in the process of carcinogenesis. The fact that there are no significant differences between tissue from healthy individuals and the normal tissue taken from the individual with adenomas or carcinomas suggests that it is not a primary defect in the mRNA levels of the single type IV collagen chains or type VII collagen that leads to development of cancer. In conclusion, we found that the mRNA levels of α6(IV) was down-regulated as a late event that coincides with the acquisition of invasive growth properties. α1(IV) and α1(VII) mRNAs were increased already in adenoma tissue and maintained at a high level in colorectal cancer tissue. A change that may be necessary but not sufficient for acquisition of invasive growth properties. Future studies are required to clarify whether changes in collagen composition are a cause or a consequence of malignant progression. The KAM study was supported by the Norwegian Cancer Society, the Norwegian Colorectal Cancer Prevention (NORCCAP) study (Grants from the Norwegian Cancer Society and the Department of Health and Social Affairs), and Eastern Norway Regional Health Authority. Associate professor Gert Hansen, Department of Cellular and Molecular Medicine, University of Copenhagen is thanked for assistance with the immunofluorescense microscopic studies. Christel Halberg is thanked for excellent technical assistance. HS conceived the idea of the study and designed the collagen primers. HS and DA performed the immunohistochemistry. EHK designed and administered the KAM study and collected the samples. IMBL evaluated the tissue sections. KMT contributed with scientific advice to the KAM study. LV and DA carried out and evaluated the RT-PCR. LV performed the statistical evaluation. All authors helped interpret the results, writing the manuscript and approved the final version.